Pictures & images of Sardis (Sart Turkey), the capital of the Lydian Empire situated in western Turkey. 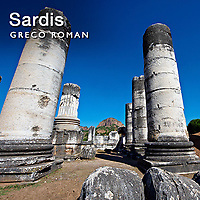 Sardis was one of the great important cities of Asia Minor that thrived under the rule of King Croesus famed for his wealth and the minting of the first bimetallic coins in gold and silver. Croesus fearing an invasion from the Persians consulted the Oracle of Delphi asking if he attacked the Persians would he win. He was told that if he attacked the Persians a great Empire would fall. Taking this as a good omen Croesus attacked the Persians and a great Empire did fall, that of the Lydians as the Persians took and sacked Sardis and Croesus ended his life as a Persian slave. In 334 BC Sardis fell to Alexander the Great who sacked the city in revenge for the Persian sack of Athens. The Romans then conquered Sardis and building fine buildings like the reconstructed Bath Gymnesium that can be seen in our photo collection. The gymnasium is a typical Greco Roman design of Anatolian Roman cities incorporating Greek classical features with Roman architecture. In 1963 excavations unearthed perhaps the most impressive synagogue in the western diaspora yet discovered from antiquity, yielding over eighty Greek and seven Hebrew inscriptions as well as numerous mosaic floors. The presence of a 4th Cent Synagogue in a major Roman city has caused the relationship between Jews and the late Roman Empire to be re-examined. The Temple of Artimis was originally the fourth largest Ionic temple when it was originally built in 300 B.C. In 150 AD under Roman rule when the worship of the Emperor required all Roman cities to have a Temple dedicated to the Imperial family. The temple was split into two sections with one half for Artemis and the Empress Faustina and the other for Zeus and Emperor Antoninus Pius and the present construction shows elements of Greek and Roman styles.